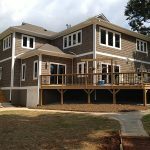 We handle commercial building and renovation projects in the Cornelius area with the same passion and quality workmanship that we give custom homes. For years here at Chad Goodin Signature Homes, we have been known for quality custom homes and home renovations in the Cornelius, North Carolina area. While maybe not as many people are aware of it, we are also exceptional at commercial building and renovations. We give these projects the same attentive care that we do residential projects because we know the success of your business may depend on us delivering a quality result. Our success also lies in the fact that we provide exemplary customer service, which is also vitally important when a commercial building is involved. We keep you in the loop throughout the project and work with you, so the process doesn’t disrupt your business. Our design team is great at what they do and can work with whatever plans you already have in mind or provide you with suggestions that will meet the criteria you have for the project. Our commercial building services are perfect for all types of jobs, from small renovations to full builds. Our years of experience are part of the reason why we are able to complete projects quickly. We have developed efficient techniques that will get your project done quickly and on budget, without sacrificing quality. If you are looking to do a tenant buildout, renovation or other commercial building project, we hope you’ll give us the opportunity to give you a quote. We are confident that you will see why so many people have trusted us to turn a dream into a reality. Call us today, so you can be added to our list of satisfied customers.